As seen on Ireland AM on February 6th 2015. Light and airy, Marc Jacobs Daisy Dream Eau de Toilette is both floral and fruity. The fragrance captivates with delectable top notes of blackberry, fresh grapefruit and succulent pear. The middle notes have rich, feminine, jasmine notes, with a base of white woods, musk and coconut water. Suitable for both daytime and evening wear, Daisy Dream will be enjoyed by women of all ages. Armani Diamonds Rocks is a woody citrus fragrance with top notes of bergamot essence, pepper essence, apple accord, middle notes of geranium essence, violet leaves accord, marine notes and base notes of gaiac wood essence, vetiver essence and cedar wood essence. For the modern man. Emporio Armani She: Like the softest touch of skin on skin, this Giorgio Armani Emporio Armani Elle Eau de Parfum unwinds in perfect harmony with the body. The soft, ultra-feminine fragrance captures the innate beauty of all women. A timeless scent that caresses the skin in a cascade of delectable notes. A fresh opening of mandarin and pear lend a soft sweetness to the fragrance, together with the creamy heart of heliotrope and almond. Vanilla and cedarwood provide a resolutely sensual base to the fragrance, a warm finale that leaves a lasting impression. 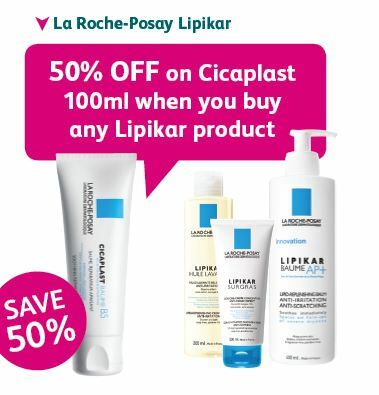 We also have 40% off La Roche Posay Cicaplast Baume Soothing Repairing Balm 40ml – €4.50 (was €7.50) with no purchase necessary available online & in store.